When I first heard about families that travel full time it didn’t take long to locate them on the internet. It seems many of them are kind enough to document their adventure online via a blog. Many were like ours where they are simply journaling for personal posterity and maybe a few curious friends and family members living vicariously through their blog. These provided inspiration but not really any instruction or information. Others seemed to start down the path of providing more valuable content for newbies but the posts got few and far between before they just stopped altogether. But there are some that have stood the test of time and are still putting out regular content that is useful for the community. A few of my faves are Gone with the Wynns, RV Geeks and Ditching Suburbia. Austin Day 2 – God answers prayers! Today it’s just the kids and I. Huck wanted to come, but he has to get some work done. After yesterday’s terrible navigation experience I’m not sure if I’ll have much luck getting us around. We tried to find a transit station thinking it might be best to take buses so I didn’t have to park the Beast in downtown. Huck said do NOT park in a garage – wise words considering past experiences I’ve had with tall vehicles and parking garages! Street parking it was assumed would be super hard as well. I’m not great at parking this thing! But we spent about 20 minutes trying to find this transit station. We prayed, God if you want us to take the bus, help us find this place! Finally found the place, but couldn’t find a place to park and couldn’t see a sign of anyone I could talk to to get advice on getting around. We had wasted enough time, so off we went to the big city in the big Beast. Steph and the kids spent a second day exploring Austin and on their way home they called to let me know that smoke was coming out the hood of the truck. ARRGGGHHH. They made it back home and I met them out front so I could examine more closely. Sure enough….white smoke coming out near firewall on passenger side. I can see the source is at a clamp joint on a vertical section of….can you guess? Thats right, the exhaust!! It seems like this joint is known to get misaligned and smoke during a “regen”. You can read all about how the Duramax handles regen here but the gist is the diesel particulate filter (DPF, also know as a “wallet shrinker”) gets soot build up in it if exhaust temperatures aren’t hot enough. When you are pulling a 14.5k pound 5th wheel across the country I think the exhaust gets hot enough to keep ‘er clean. But when you are putzing around town and sitting in traffic the fancy on-board computer decides that it needs to burn off some soot so it goes into “active regen” where fuel is injected directly into the exhaust system. So, we have this state of the art exhaust system that is supposed to reduce emissions but the same system purposefully uses fuel inefficiently?….I don’t get it. Anyway, because I am such a diesel motor expert now I decided to ignore it because the next day we were hitching Ava up and would be trucking down to San Antonio which would surely heat things up and clean out the soot. We also had a harddrive crash on one of our laptops and a battery fail in one of the kids’ tablets (2nd battery I’ve put in the thing too….crikey!). But we’re all still healthy and still having fun! Hmmmm. This was an interesting day! The kids and I took too long getting up and around. I swear we are still on Mountain time! We loaded the bikes and were so excited to explore the much acclaimed Zilker Park! We went to the visitors center first to get armed with information/maps as I felt kind of lacking in those areas despite our research. I had our maps and thought we were ready. 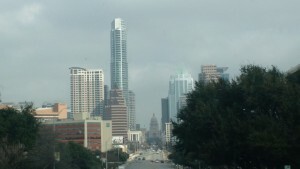 Here’s a pic of the Texas State Capital Building (the small brown dome in the background) coming up Congress Ave. It should not be a surprise to those who know me that I’d rather be on a bicycle than in a car. And if I must be in a car, it will be a super small fuel efficient vehicle. Given our choice of a large 5th wheel this required a large truck which is neither a bike nor a small fuel efficient vehicle. On a recent excursion to Austin we found ourselves in HEAVY rush hour traffic where we were sitting still and the smart cycling commuters were flying past us. We had all 5 bikes in the back and I was so frustrated I almost suggested we ditch the truck and go the rest of the way on bikes. Then one of the boys used the “D” word!! They asked me “is this as bad a Denver?”. My family knows how much I hate driving through Denver…traffic is always bad….ALWAYS. So for me, Denver is a bad word. After our experience in Austin we may have a new bad word, the “A” word! There is a lot to like about Denver…and we did have a great time in Austin (especially when on our bikes). But traveling through either city with the other “A” word (automobile) makes my skin crawl.